Four instances of SCP-3904 (designations unknown) accompanied by Subject 3904/04 ("Jiggles"). Special Containment Procedures: All SCP-3904 instances are currently kept in cold storage in Site-66. Should testing be required, live instances of Felis catus (Domestic housecat) can be requested from the Site-66 breeding pen. Description: SCP-3904 are male human cadavers with drastic alterations to their internal structure. 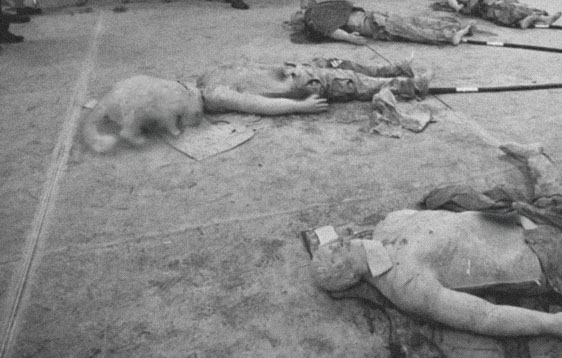 The tissue comprising SCP-3904 instances is structurally similar to non-anomalous human flesh, but is highly resistant to decay and constantly emits an odour described by personnel as a combination of formaldehyde and catnip. SCP-3904 instances are capable of cellular regeneration despite their lack of nutritional intake; wounds inflicted on SCP-3904 instances will heal over time, but at a rate slower than that of a non-anomalous human body. Each instance of SCP-3904 can be distinguished from non-anomalous cadavers by the prominent hollows in its thoracic and abdominal cavities caused by the extensive removal of vital organs. Each compartment is covered by a flap of skin and muscle tissue with smooth, cauterised wound edges. In the thoracic cavities of SCP-3904 instances, the lungs, heart, and the lower ribs will have been removed, leaving the diaphragm intact; in the abdominal cavities, all organs have been removed. All tissue damage incurred via removal of the organs has been smoothly scarred over in all instances of SCP-3904. Each hollowed cavity in SCP-3904 is large enough to comfortably accommodate one adult domestic housecat. When filled with two cats in this manner, SCP-3904 spontaneously animates. Animated instances are sentient, but do not appear to be sapient. Instances are capable of bipedal locomotion, albeit with a distinctive stilted or "reverse-jointed" gait, and are incapable of speech, likely due to their lack of lungs. When solitary, animated instances of SCP-3904 are observed to wander around aimlessly until vacated by their interior cats. However, when two or more instances are animated in the same vicinity, they will begin to engage in a form of rudimentary wrestling, wherein the aim appears to be the dislodging of each other's interior cats. It is unknown whether this is due to anomalous compulsion on the part of SCP-3904 instances, or simply the result of natural feline behaviour. Notably, under controlled conditions, 70% of cats appear to prefer resting inside the interior of SCP-3904 instances over resting in other similar warm, dark, and confined spaces. The significance of this is also unknown.